As with many of these provincial châteaux, Puyguilhem testifies the rise through the social ranks of a landed gentry family located in Périgord. 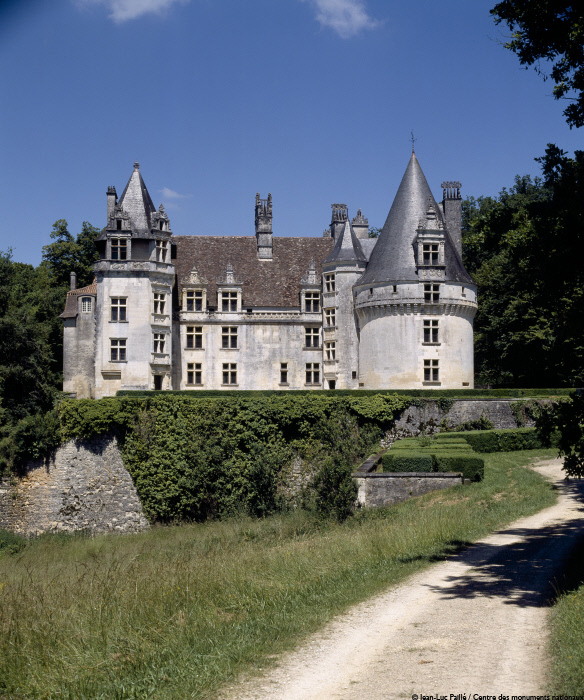 Records of a fortified house on the site of the current château date back to the 12th century. Part of the foundations of the existing château belonged to the previous mediaeval house. Jean de La Marthonie, adviser to the Guyenne Parliament, purchased the estate of Saint-Jean de Côle, a short distance from Puyguilhem, in the second half of the 15th century. His son, Mondot, was the fourth President of the Bordeaux-based Parliament until 1515. He added to the family’s assets by purchasing the Puyguilhem house from Alzias Flamenc in around 1508. Pierre Mondot de la Marthonie, as an authorised legal counsel to the Guyenne Parliament, became an indispensable member of the court, and had a particularly close relationship with Louise of Savoy, Duchess of Angoulême. When Francis I came to the throne, Mondot was rewarded for his loyalty to the king’s mother, and was appointed as the first President of the Paris Parliament on February 3rd, 1515, one month after the king’s coronation, replacing Antoine Duprat who had been moved to the position of Chancellor. It was an extremely important position, and he became one of the key servants to the French monarchy. The Paris Parliament, a sovereign court, had been relatively powerless under the reign of Louis XI, but gradually began to gain more influence. La Marthonie’s appointment, openly supported by the king’s mother, was widely decried in the Parliament, as were the appointments of his successors, also with the support of the king’s relatives. Francis I responded firmly to these murmurings and even appointed Mondot as royal affairs assistant to regent Louise of Savoy during his first expedition to Milan. In the king’s absence, Mondot was given responsibility for guarding the privy seal – a duty assigned to the Chancellor during peace times. In spring 1517, still enjoying royal favour, Mondot de la Marthonie died suddenly at the château of Blois, in circumstances that remain something of a mystery to this day. Had his runaway success gained him such hardened enemies that he suffered an untimely demise? Before his death, however, Mondot had commissioned the construction of a new château in Puyguilhem, funded by the money earned from his duties. The work was suspended following his death in 1517, and was subsequently continued by his brother, Gaston, Bishop of Dax, then by his son, Geoffroy. The royal favours enjoyed by Mondot and his two ecclesiastical brothers were never to be repeated for the La Marthonie family. Following a series of owners, the château fell into the hands of the Chapt de Rastignac family in the 18th century. The family carried out a number of embellishment works on the building, including the addition of a perpendicular wing to the north and a makeover of the interiors using wood, painted wall coverings and marble fireplaces. The château was also once owned by the house of La Rochefoucault, as the heir of the last Marchioness of Rastignac. Puyguilhem was sold in the 19th century, and was gradually abandoned and pillaged. Despite being listed as a Historic Monument in 1912, the property was in such a dilapidated condition that the French state commenced compulsory purchase proceedings and acquired the château in 1939. The property underwent 20 years of painstaking restoration work, led by Yves-Marie Froidevaux, Chief Architect of Historic Monuments. The castle consists of two main dwellings, at right angles to one another, each served by two polygon-shaped staircase towers. The main dwelling is connected to a large, round tower with decorative machicolations and cannon ports in the lower section. Part of the dwelling and the perpendicular building, along with the tower, date back to the first wave of construction commissioned by Mondot de La Marthonie in 1515 and continued by his brother until 1524. These spaces, which retain their traditional mediaeval styling, feature bas-relief scrolls and friezes depicting enigmatic letters – most likely encrypted tales of morality. The spiral staircase serving the interior space is housed in a separate, polygon-shaped tower, with sculpted elements that are once again notable for their Gothic influences. The second wave of construction work, between 1525 and 1535, included decorative procedures typical of the Loire region. The detailing at the top of the main dwelling, the skylights with pediments and the high, sculpted chimney stumps all bear the hallmarks of newly developed practices. The honorary pavilion, which houses a vast spiral staircase, is highly decorative, with styles taken from the time-honoured classical tradition. 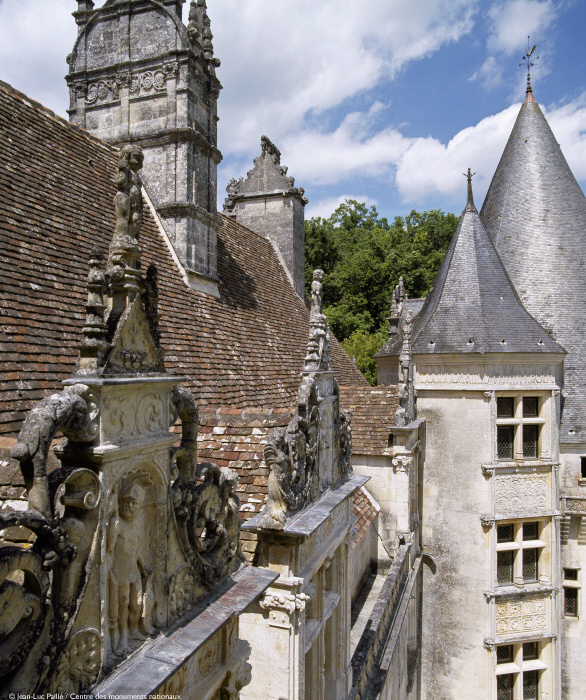 Below the roof runs a sculpted balustrade with two richly sculpted skylights, directly inspired by existing examples at the Château de Bonnivet in Poitou, built by another close friend of Francis I, Admiral Gouffier. Despite the changes made in the 18th century, the interior of the main dwelling was restored to its original layout, again in line with the plans of châteaux from the first half of the 16th century. Each floor features a large room leading to an apartment, consisting of a formal bedroom, a dressing room and a bathroom. The second apartment is housed in the perpendicular wing. Some vestiges of the original décor remain on the first floor, including a vast fireplace with a mantelpiece that includes depictions of the Labours of Hercules. The allegorical imagery on the skylights of the main façade (probably Fortune, Despair and War in conjunction with Mars) and the tales of morality sculpted on the polygon-shaped tower attest to the rich iconography of this property, demonstrating the educated and erudite nature of the La Marthonie family.